Engineering is a broad discipline that covers a wide range of specialized fields, each which applies scientific knowledge to solve real-life problems. Some of the branches of engineering include chemical, civil, electrical and mechanical among many others. A doctorate in engineering regardless of the particular field is earned through research and advanced study. An essential part of any PhD engineering program is the dissertation which is written based on original research in the particular field you are in. PhD candidates select their own research topic and should choose it carefully considering how important the dissertation is to earning their degree, or they may ask engineering PhD thesis writing service to help them. Want to know what is thermal engineering? Get an answer right away! What process mapping methods can be used in identifying bottlenecks for a supply chain industry? 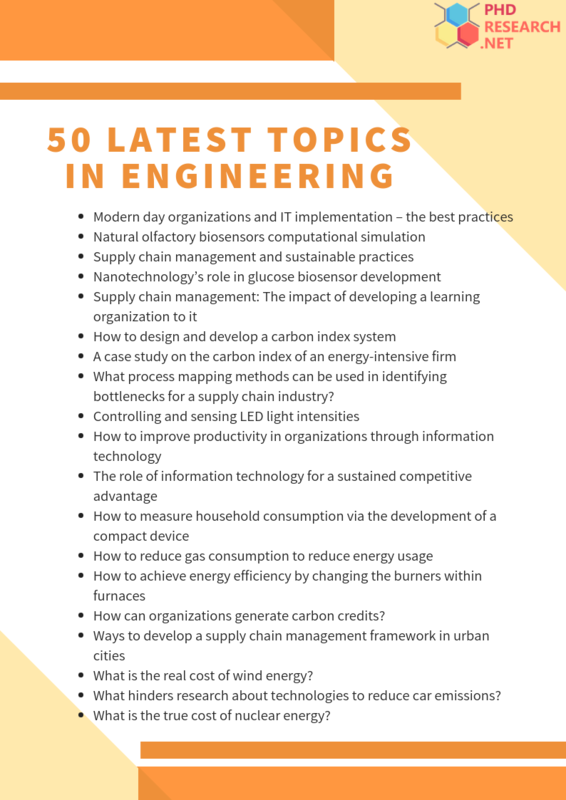 Download list of PhD 50 topics in engineering right away! Research topic selection is difficult for many students. It must be something that contributes to the field and allows you to demonstrate the skills and knowledge you have acquired. Consider several topics: you are allowed some time to make your topic selection. Initially, you may want to consider several different ideas before you commit to one. Do a little research on each idea and see if one stands out from the rest. Choose a topic you are familiar with: you don’t want to have to start completely from scratch as that will eat up a great deal of time. Consider topics in an area you are familiar with and preferable one that makes use of your strongest skills. Select a topic you have some enthusiasm for: it helps a great deal if you select an engineering research topic you have a genuine interest in. You will be spending several years with the topic and if you aren’t truly interested in it you may get bored and not put in the effort required. Consider faculty interests: it is preferable that at least one member of the faculty has an interest in the topic you select. The chances are pretty good the engineering PhD thesis will be the most difficult paper you have ever written. Write succinctly: A clear concise writing style is preferable for your dissertation. Avoid using unnecessary words that don’t contribute to your paper. It isn’t unusual for students to encounter problems when working on their dissertations. Our company offers engineering dissertation assistance for every step of the process. Our professional writers have engineering PhD degrees themselves and are well versed in the academic writing process. We guarantee all work we provide to completely satisfy all of your requirements. Even if you need help not with engendering but with dissertation topics in management we will find an expert who has expertise in your subject area. 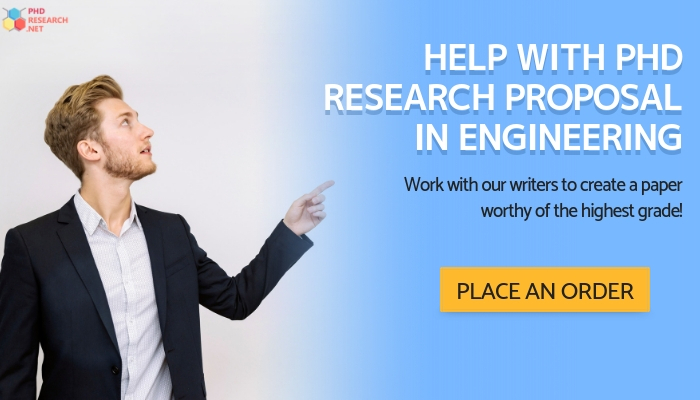 If you encounter difficulties with selecting research topics in engineering or any other aspect of the dissertation process, contact us for the first rate assistance provided by the experts in the field!